If a custom bike rack has been something you've been considering, you're in the right spot. We're taking our dozens of years of custom bike rack design and creation and sharing what you need to know to make it a smooth process. These insights will help you take a concept and turn it into a custom rack that will stand as a proud embodiment of your business, community, school or other organization. Yeah. We're excited too. Let's get started. I'm Interested in a Custom Bike Rack. Where Should I Start? To be successful in getting a custom bike rack that excites you and the people who come into contact with it, all you need to start is an idea or concept, and a general budget range. 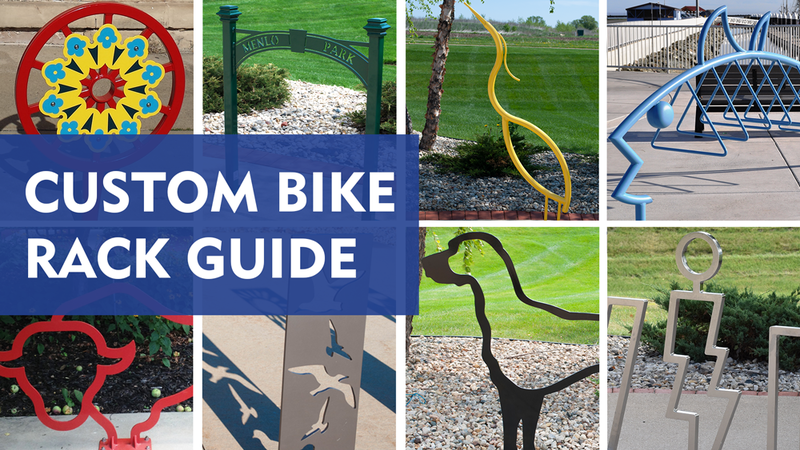 Since you're here looking for information about custom bike racks, you probably have a thought of what you want or saw a rack that peaked your interest. That's a great first step. It's also likely there are bike rack customization options you never knew were possible. To help develop your idea even farther, use the links below to scan through dozens of custom bike rack examples. Now that you've got ideas flowing for what your custom bike rack could be, it's time turn to turn our attention to the practical part. The budget. What is the Cost of a Custom Bike Rack? Having a budget range for your custom bike racks is important as it will give you an idea of what customization options are realistic from the very beginning. Because each project is custom and has a unique set of circumstances, it's nearly impossible to list precise dollar amounts for a custom rack at this point. To help you begin to gauge expenses, there are three general tiers of customization. Prices tend to jump for each tier. The first tier of customization is plates with cut-outs. These are sheets of steel that can have logos, letters and other objects as cut-outs or can be cut into these shapes. The plates are then attached to traditional bike racks. The next customization tier would be cutting objects out of steel that become the bike rack. This is a great option for customizing a bike rack. Because a laser is used to cut the steel, it allows for precise lines to be followed that can be used to cut out objects. This provides almost limitless options for what your bike rack could be. The third, and most costly, customization tier is for completely custom rack designs which typically involves bending steel tubes into objects. I'm Still Interested. How Do I Start the Process of Getting a Custom Bike Rack? With some concepts in mind and an expectation of what is going to require a greater budget, now's a good time to get the custom bike rack process started. To do this, you'll want to have a consultative discovery call with a customer representative. What is your goal in having a custom bike rack? What do you want the rack to portray? Do you have a specific reason for wanting a custom bike rack? What is your budget for custom bike racks? Who will primarily be using the bike rack? How many bicycles should the rack park? Talking through this information, the sales rep can share some feedback on the best type of rack to match your concept based on how the rack will be used. You'll find out what is possible or not possible and get some direction on a plan to move forward. Going through these details also allows the customer rep to give better guidance to the designers and ultimately present you with the best options for your situation from the beginning. The custom bike rack process can take several weeks from first call to delivery. Start the process now. Contact us today and a custom rep will reply within one business day. After the discovery call, the information collected by the customer rep is shared with a designer. They will use the feedback to create options of what the custom bike rack could be. This is typically in the form of an illustrated drawing. If you will be using logos or other custom artwork as part of your bike rack, you will want to collect the vector files (.ai, .dwg, .eps, for example) and share them with your customer rep so they can be incorporated into the design. Once ready, the drawings are then shared with you to see what your custom bike rack could look like. At this point pricing and general timelines for production and shipping can also be provided. The customer rep will then work with you to incorporate any modifications to better meet design and/or budget preferences. New options and drawings would then be created and shared with another round of feedback. 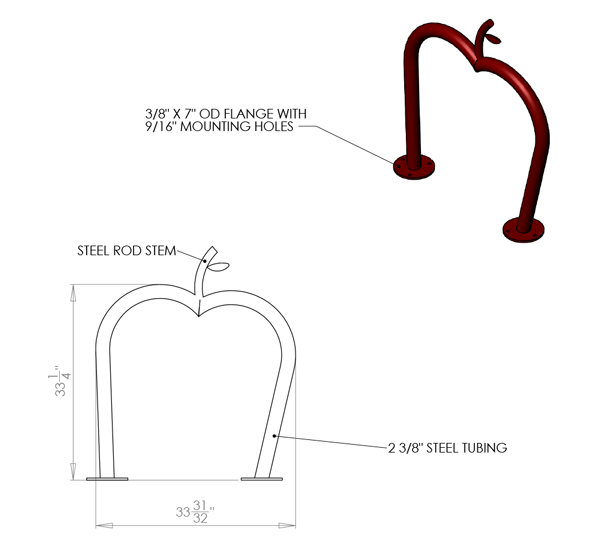 Once the design meets your approval, you would confirm the drawings and submit an order for your custom bike racks. What Else Will I Need to Get My Custom Bike Rack? You'll need to consider how you plan to receive the bike rack when it arrives. Your customer rep will review your options and details for how the rack will be shipped. But you'll need to plan for how it will get off the truck and moved to where it will be installed or stored until it's installed. These details should be worked out before the bike rack shows up at your door. You should also know how you plan to assemble (if necessary) and correctly install the bike rack. Again, your rep can provide guidance on these items, but you'll want to figure this out earlier rather than later.